In the 1960s the government decided to complete Parliament House, which had only been partly built between 1912 and 1922. Prime Minister Keith Holyoake had wanted to complete the original plan, but the government architect persuaded him to put up a modern building. 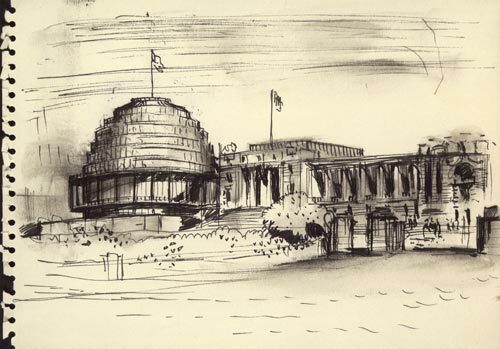 British architect Sir Basil Spence drew this sketch of a round building rising in steps – reminiscent of a beehive. The distinctive building was opened in 1981. Officially the executive wing of Parliament, it is better known as the Beehive.